Dwarf puffers may not be the best fish for a community aquarium, but their interesting behaviour and adorable looks make setting up a special tank more than worth it. Keep reading for everything you need to know about dwarf puffer fish and keeping dwarf puffers in your own aquarium! Dwarf Puffers are naturally found in slow moving waters in south-west India such as the Pamba river. According to the IUCN Red List of Threatened species, the deforestation, urbanisation and overfishing for the pet trade in this area have resulted in the Dwarf Puffer being listed as Vulnerable. These little guys are the smallest known puffer species: most of them grow to an adult size of about an inch (2.5 cm). Their eyes can move independently, which allows them to closely look at something without having to move. Depending on their mood, their colors vary from green to brown with dark spots. The belly should be white or yellowish and smooth after feeding. If your Dwarf Puffer’s belly looks lumpy even after a meal, it might have internal parasites. Males can be distinguished from the females by the dark line that runs along their belly and the “wrinkles” behind the eyes. Dwarf Puffers don’t need big tanks, but try to keep them in at least 10 gallons (40l) for the first fish and 5 extra gallons for every additional one. The tank should be completely cycled before the puffer is introduced; any traces of ammonia or nitrite can be deadly. Adding salt is not necessary and might actually harm this freshwater puffer, even though it’s still recommended sometimes. When setting up a tank for a dwarf puffer, it’s very important to create lots of hiding places to make sure the fish feels safe and prevent stress. Also be sure to add some interesting stuff for your puffer to explore, as these fish are quite intelligent and get bored very easily, which can result in glass surfing. If you spot your puffer swimming up and down the glass it’s time to add more plants, rocks and decorations! Live plants like Java Moss and Java Fern are essential and my personal favorites because they are so easy to grow. If you have multiple dwarf puffers, a well-planted environment with broken sight lines will help them establish their own territories more easily. The photo below is a good example of what a dwarf puffer tank could look like. Many people add Dwarf Puffers to their aquarium because of their effectiveness when it comes to eating snails, without thinking about what they’re going to do with the puffer when all the snails are gone and it starts nipping at other fish. Be careful when choosing tank mates. They may be small, but that doesn’t mean these puffers are suitable for just any community tank. They’re best kept alone or with small, quick tankmates like Kuhli Loaches and Otocinclus to prevent fin-nipping and chasing. If you’d rather set up a Dwarf Puffer community, be sure to go for at least 5-10 gallons (20-40L) per puffer and a heavily planted tank. Non-aggressive shrimp like cherry shrimp have also succesfully been kept with Dwarf Puffers, as the adults seem a bit too large for the puffers to eat. Unlike their larger cousins, dwarf puffers don’t need hard snail shells to keep their teeth short. This doesn’t mean they don’t enjoy eating snails, though: in the wild, these are their main food source. You can easily breed common pond snails or ramshorn snails yourself. A full guide can be found here! Most Dwarf Puffers will also happily accept frozen foods like bloodworms, mosquito larvae, tubifex. The gif below shows a dwarf puffer happily slurping up a bloodworm! Live foods like blackworms are also appreciated. These are great main food sources, but don’t forget to soak any frozen foods in water before feeding and make sure you don’t overfeed your puffer. Pellets and flake foods are rarely accepted and shouldn’t be fed too often because of the lack of nutritional value. You can find a full article on breeding snails here. Their intelligence, curiosity and high activity level make these fish incredibly interesting to watch. They often learn to recognize their owners and will closely monitor your every move when you’re near the aquarium. Breeding Dwarf Puffers is considered to be fairly difficult, but very important! According to the IUCN, their population in the wild has declined by 30-40% over the past five years, and yet they’re still being caught from the wild. If more people tried to breed them responsibly, then maybe this wouldn’t be necessary any more and the population would get a chance to restore itself. If you want to breed Dwarf Puffers, be sure to get more females than males to prevent the females from being overchased. Spawning behaviour can be triggered by doing water changes with slightly cooler water. The eggs will be deposited in spawning mops or Java Moss and can be kept in floating containers or a small tank until they hatch – be sure to choose a container/tank that allows fresh water to flow past the eggs, or they can become infected with fungus. When the fry hatch, they can be moved to a barebottom grow-out tank, which should be kept very clean. The fry can be fed with tiny foods like microworms. Grindalworms and baby brine shrimp can be given when they’re slightly bigger and will do fine until they can accept regular sized foods. If you still have questions about keeping dwarf puffers or if you want to share your experience with them, be sure to leave a comment below. Happy fishkeeping! What is the labyrinth organ? What kind of light timer schedule do I keep. Currently have it set for 12 hours on 12 hours off, what do you recommend? I want to get one of these cuties for my 10 gallon tank, but it already has 5 guppies and 2 platys, also 2 nerite snails. Should i wait until the tank is empty, or can i plan on getting one? Hi! I´m looking for some plants to put in my tank. I´m going to put some dwar pufferfish so I thought this would be the best place to ask about that. As you can read in the caresheet puffers will like any plants that are tall and offer lots to explore. Some easy plants that I like are: Crytocoryne (read more here), Anubias (read more here) and Java fern (read more here). As for light, I usually use cheap led lighting kits, you can buy them on Amazon. They work fine for the plants above! Thanks! But I meant: do the pufferfish need any kind of light intensity/colour? The last one, I swear haha: I read the pufferfish had to breed on moss pads, does the java moss work or is there another kind of moss that is better? For spawning, every fine leaved plant works. It doesn’t even have to be moss! Java moss would be fine, yes. One thing I want to mention since it seems like you’re dedicated to giving the puffs a good life: I’ve kept one and I don’t agree with the tank sizes many sources list. For example, Seriously Fish, which I normally love, says 13 liters is enough for a single puffer. It’s not! I really recommend going for around 40 liters for the first puffer and then 20 extra liters for every additional one. Yes, I´m trying to get my future puffers the best life as possible. So I´m going to put a medium lightning and some amazon frogbit to make some contrast and also to shade some plants that need this. About the carpet I´m not very sure what to plant… Do you think java moss would be a good idea? I´d put it on the sides an then a clear path on the middle. I discarded dwarf hairgrass due to his lightning needs (too intense), and some others. So as you see I´m not that sure about the lightning hahaha. I don´t think I´m going to buy some tank mates, I´ve read a lot about that. Due to that fact, I´m now worried about the tank maintenance, because they are very sensitive to nitrites and ammonia (some tank mates could help about that), how could I fix that? Do you think that some plants that use those as nutrients would be enough? Then, I´m not very sure about how hard the water hast to be. Puffers need 5º to 25º but which is the best water hardness for them? Talking about the substrate, I´m going to put first some for plants and then sand, is this a good idea? I don´t know because if then I have to use some kind of fertilizer in the substrate, that ix could make it difficult. Amazon frogbit sounds great, your puffer will love the long roots. It will make it more difficult for you to grow any carpets, though, as it does shade things a lot. Java moss is not my first choice for a carpet personally, I would actually personally go for dwarf hairgrass as it’s a good option for medium light. I’ve grown it with one of those basic LEDs I mentioned earlier, which is only around 1000 lumen. Most other carpeting plants need very intense lighting. Some other lower light options that come to mind for me are Staurogyne repens or other aquarium mosses that work better as carpets. Flame moss, christmas moss and phoenix moss could be good, I especially love the phoenix moss myself. As for puffer sensitivity, just make sure your aquarium is cycled very well before you introduce the fish. I assume you know what cycling is, right? Just use a liquid test kit to test everything extensively. Plants will help, yes, they keep things a little more stable. But your cycle and regular water changes are most important. Hardness is not too much of an issue, it’s better to keep it stable than to make it ideal. If you start to mess with your hardness you might cause all kinds of spikes in water values and that’s much worse for your puffers. Have you tested your hardness yet? Where’s it at? As for substrate, the option you mention (capping dirt with sand) is not my favorite as it can be veryyy messy. Replant one plant and there’s dirt floating all over! My personal preference is using an inert substrate (without nutrients, I like pool filter sand) and then using root tabs and possibly dosing liquid nutrients for the plants. But really, many low tech plants grow just fine without dosing anything at all! Hahaha, yeah I´m trying to organize everything before I start doing it. The only thing I do have doubts about is the substrate, do you thing plants as vallisneria, brazilian pennywort etc. That have to attach its roots to the substrate, can do it in pool sand? Hi! I love your blog, its very helpful! I’ve got a 29g tank with 9 kuhli loaches and 4 corys (I’m getting two more soon, but they seem fine) and I was wondering how many puffers you would recommend in their tank? I know you want odd numbers if you do groups, so I was considering either 3 pea puffers or giving the corys to a friend and then getting multiple puffers. Any advice would be greatly appreciated! I think you’re pretty much spot on with your thinking. Going by my own guideline of 10 gal for the first puffer and 5 extra gal for every next one your max would be 5, though if you keep the Cories I would stick with 3 like you said. They LOVE tons of vegetation so just plant that tank until you can barely see them and they’ll be at their happiest, haha 🙂 and keep an eye on your water values, they’re messy eaters so nitrate spikes are always a risk. Hi! I have a 10 gallon with 2 clown loaches and a few ghost shrimp and some plants. Would you recommend a puffer or not. Need help. I would absolutely not recommend a puffer, sorry. Unfortunately your tank is infinitely too small for two clown loaches and I recommend rehoming those ASAP. They will suffer and eventually die prematurely in there. Once you have rehomed them you can then consider a single dwarf puffer as stock. If you’re not sure why I recommend rehoming the loaches, be sure to have a look at their caresheet here. They get HUGE and need to live in groups. Good luck! I hope you take my advice. As you can read in my other reply your current stock is not suitable for a 5 gallon at all so you’ll have to fix that before you can consider other fish. 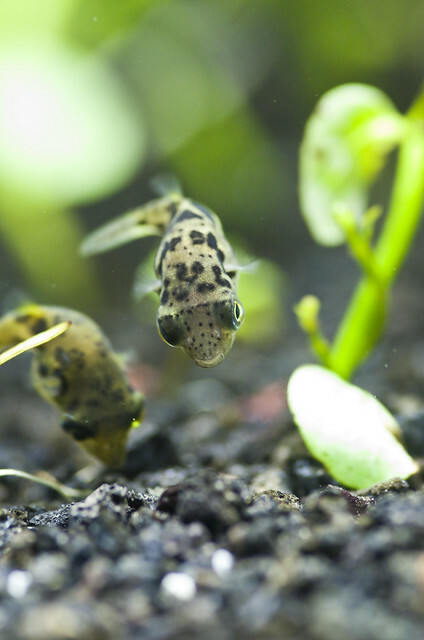 Even then a dwarf puffer isn’t an option (nor is a green spotted puffer – they need way larger tanks), they are more suitable for 10 gallons and up. They also can’t be kept with guppies, pleco’s are an option but bristlenoses need at least around 30 gallons due to their high waste output. Your bristlenose pleco is likely hiding because it’s stressed and bad water values are making it sick. The article on stocking a 5 gallon fish tank lists the only options for a 5 gallon tank. Hope that helps! I’m currently researching to buy a dp. I have a well cycled 10 gallon tank that has been up and running for months. I saw you say earlier to take out any activated carbon from a filter. Why is that? Also I plan to have just fake plants in my tank because I can’t seem to keep any plant alive (not even a java fern). I plan to just get one dp to have. I currently have a mystery snail in my tank and a Chinese algae eater. Could these two become a problem to the dp? Activated carbon is not for full-time use in an aquarium because it immediately removes any chemicals from the water. This might be detrimental to your water quality (as good things also get removed). It’s a good idea to always keep some carbon on hand though, as you can use it to remove medication if necessary. Fake plants and a single dwarf puffer sound fine as long as the tank is heavily decorated, but the tankmates might become a problem. Mystery snails produce a LOT of waste, which might not end up well as dwarf puffers are very sensitive to bad water quality. I actually only recommend them for tanks of 15+ gallons. If by Chinese algae eater you mean Gyrinocheilus aymonieri, that will definitely be problematic as well. These fish are real troublemakers (and they don’t even eat algae past a certain age). They also get very large and aggressive. I unfortunately have to recommend rehoming that one as a 10 gal is much too small for it! I hope that answers all your questions. Good luck! Do you think I could put a Dwarf Puffer and three Oto Cats in a 10 gallon? Hello! That would theoretically be possible I guess, but I wouldn’t go for it. Otocinclus are very fragile and dwarf puffers are very messy; with this stocking level plus the messy eating your water values might become dangerous. Also, otocinclus catfish prefer larger groups, which works better in a larger setup! I’d try just sticking with the dwarf puffer and maybe some shrimp. Hi! Great to hear you are doing some research beforehand. Have you had a look at the articles in the setting up an aquarium category yet? The one about cycling is a must read especially, it explains exactly how long the tank should sit with the filter running before it’s safe. The 10 gallon with the sand sounds good. I do think you can use (some) live plants just fine, easy plants like Java fern almost always work well even if you don’t have a green thumb. I’ve got an article about easy plants here if you’re curious. As for filters, if you buy a 10 gallon tank kit it might come with one, which should be fine. The ones they sell at the aquarium store should also work fine, just be sure to remove any activated carbon if it’s in there. The water quality tag contains some articles about filters, types, filter material, etc. As for snails, dwarf puffers are actually one of the only puffer species that don’t necessarily need them to shorten their teeth. You could do (thawed) frozen foods such as mosquito larvae, bloodworms, etc. as staple foods and culture your own live foods on the side. A snail colony is very easy to set up (described here), a fish bowl should work fine for them and you’ll always have your own supply so you don’t have to rely on the pet store. Does that answer all your questions? Be sure to just read, read, read and feel free to ask if you need any more info. Good luck! Hello! I’m looking to get a dwarf puffer sometime in the next few months. Im currently in the process of cycling a 10 gallon with a lot of hides for him. However, it is fully stocked with silk plants and I was wondering if it is ok to have silk plants instead of real ones. Thank you! Good luck with your puffer! Your setup sounds great. Do they need some salt in their aquariums? On some other websites it says to add 1 tablespoon of salt per 5 gallons. Is this true? They absolutely do not need salt and it’s as harmful to them as it is to other strictly freshwater fish (can be found in the article under “requirements”). There are some brackish puffers but this is not one of them! Do you know what the best place to get a dwarf puffer online in the U.S is? Thank you in advance. I don’t, sorry! I’m located in Europe. Any readers who might be able to help out feel free to comment! You also might enjoy linking up or just being in touch with Richard! Live aquaria has a pretty good selection. Thank you so much for this article! It’s so neat and straight to the point, not to mention super informational. I would like my dwarf puffer to start eating my MTS but he never wants to hunt for them and it doesn’t help that they’re always in the substrate until I turn off the lights. Will my puffer hunt in the dark? Or should I switch to a different kind of snail? I’m currently feeding him frozen bloodworms, which he’s happy about, and I’ve read that you said to try not feeding them for a day or two to see if they’ll hunt but I’m so scared he won’t be able to find the snails under the substrate and get hungry 🙁 What would you suggest? It seems (to me) so many people are Confused, because no one is realizing there are different types of dwarf puffers that are very different! What do you mean by this? Carinotetraodon travancoricus and Carinotetraodon imitator (which is not very different) are the only types of dwarf puffers. Great article I learned a lot from reading the article and most of the comments, I have a 10 gallon tank which had 3 cory catfish in it, but they all died after a month or two. I’ve kept the tank empty hoping to sell it, but I feel like starting over with it and I was wondering if a cory catfish would be ok with a dwarf puffer or two? (depending on how many the tank can handle). Would the dwarf puffers absolutely need live plants or could they use fake plastic plants? Hi! Corydoras and dwarf puffers can theoretically be combined but unfortunately not in this tank. A 10 gallon is too small to keep Corydoras in; Cories are also group fish and should always be kept in groups of at least 6 so you can’t keep just one. The tank would be suitable for a single dwarf puffer, though (as mentioned in the article 10 gal is the minimum for one dwarf puffer). I would really recommend live plants for them as they do need to be provided with plenty of distraction. If you’ve got a black thumb that’s no problem! These 8 easy aquarium plants can be grown by pretty much anyone. Good luck. Thank you for getting back to me! thanks for the advice, but I had one more question to ask you. Besides having one dwarf puffer in the 10 gallon tank would i be able to put another type of fish in there? If I am able to, which type of fish? I’ve had puffer fish, they do NOT play well with others. But as far as 10 gallons go, you could have some Guppies (very colorful) or make it a fancy beta tank. Any small tropical fish would be okay. I loge my puffers so much and you can definitely see them watch me move about. My questions. When I bought my puffers I was told different than some of the things you speak of. I was told that they should be fed every 3 days so I’ve been doing this. Am I starving my babies?! Also was told that puffers don’t like much light, mine seem to do fine and keep happy with my LED on. I also have them in too small of a tank from the sounds of it but I’m not able to put them in the correct tank right now but they seem to be OK right now. Thank for all the great info in the article and in the comments! Hi! Glad you like the article. Unfortunately that’s definitely not enough food, it would be a good idea to bump that up to once a day. I think larger puffers require less feedings so the person who told you this might have been confused. The light thing is also pretty much nonsense, as long as your tank is densely planted it’s not a problem. If your tank is too small, I really recommend upgrading or rehoming one or more puffers to prevent territorial issues. I’ve got an 80 gallon community tank with 2 angels (used to be 4, but then one died, and then the other two paired up and were bullying the third, so i moved it to a pond I’ve got outside), and about 20 rasboras, cherry barbs, and cardinal tetras in aggregate. tank decor is a few tall rocks on one side, and dogwood with java moss on the other, with crypts and amazon swords scattered around. You would 100% run into trouble. Especially with the angels and their long fins. Sorry! great article. my wife and i got dwarf puffers once upon a time ago and knew nothing about them. pet store had them labeled communal… um about that… so most of my fish died and i had to get african knives to remove the little sobs. lol two things happened with that experiance. 1 – i fell in love with knives and 2 – my wife fell in love with puffers (she thinks they’re so cute). anyhoot, i’m upgrading to a 75gal tank for most my fish. this leaves me with a 55gal tank for my wife to get dwarf puffers. the tank will be sand substrate and i have plenty of plastic plants, caves and “sunken” ships, etc for them to hide in. i’m trying to figure out how many of the little buggers i should get and what i can keep with them. most sites just use the word “caution”, but don’t say much else. it seems that my neons were okay with them and i’ve seen them in tanks with barbs and hatchet fish at the pet store. Hi! Glad you liked the article, great to hear you and your wife are interested in keeping dwarf puffers. They’re super fun fish to keep. For dwarf puffers, 10 gallons for the first fish and 5 gallons per extra puffer is usually recommended. Now that would leave you with a huge swarm of puffers which may not be ideal, so you could try going for four or five specimens. As for tankmates, try going for anything that doesn’t have long fins or will try to bother the puffers. We only keep our dwarf with cherry shrimp (relatively succesfully) but I suspect loaches (especially Kuhli’s) and quick schooling fish will work as well. Anything peaceful, quick and not long-finned should be alright I think. One last question – is there a reason you’re using plastic plants as opposed to real ones? Real plants are definitely ideal with puffers and don’t have to be difficult or expensive, so don’t hesitate to give them a try if you haven’t before. the important things are plants, the more the merrier. fine leaved ones like watersprite are good, and ludwiga is also a nice choice. they also appreciate the roots of floating plants, as lots of little crustaceans hang out in those. if you can, keep them with a large, (30 +) colony of cherry shrimp, as the babies make good food. I have some (3) bumblebee gobies in a 25L freshwater tank, (yes, I know they should be brackish water, but they seem to be doing fine, and according to the guy I bought them off, they were collected from a river), and was wondering if I could add a dwarf puffer to the same, or if that’d end up badly? Hi! As mentioned in the article, dwarf puffers require at least 10 gallons (40L), so that’s not possible unfortunately. This is actually also the absolute minimum tank size for bumblebee gobies (15-20 gallons or 57-75L is actually a better choice), so you unfortunately you’re going to have to upgrade those (and expand your group a bit). They do come from rivers, but these rivers are also definitely brackish so bumblebee gobies need a salt grade between 1.002 and 1.008, I don’t know why the seller would tell you these don’t. It’s not true. What I would do is cycle a ~57L tank for them, move them there and then start to slowly bring the salt grade up to around 1.005. Sorry I don’t have better news! I hope you’ll follow this advice and give the gobies what they need. This article contains some fish that do work in a 25L tank. Good luck! every time I’ve tried to keep puffers, they’ve died after a few weeks. all have been dwarf puffers, in cycled aquariums, being fed live snails and shrimp. Sounds like some sort of fungus. Did you try any fungal medication when your puffers started showing symptoms? And what did the tank look like? ‘ello all! Reportedly dwarf puffers will spawn very easily if a layer of moss or filamentous algae is added…so easily, in fact, that they will spawn constantly and potentially stress themselves out from spawning so often :(. Might not be a good idea to have moss in the main tank. Puffers aren’t fish that swim in one particular water layer! You’ll find them all over the aquarium. Hi! No, you don’t have to trim the teeth of a dwarf puffer, they don’t use them like other puffers do and there is no risk of overgrowing. Coral is not required for any puffer nor does it help keep their teeth short – only hard foods like mussels do that! 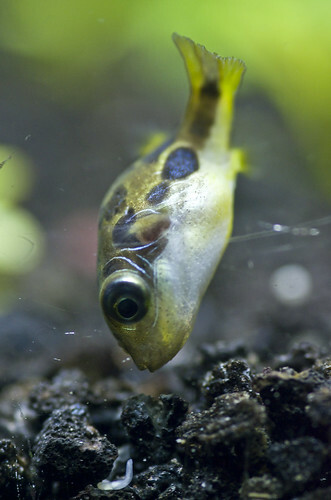 As mentioned in the article, dwarf puffers are 100% freshwater fish. They definitely require a densely planted tank, so live plants are a must. I was looking at these little puffers at my local store. They are new arrivals so they are still under quarantine. Any idea if they are compatable with Chinese Fire Belly Newts? The newts secret toxins so if the puffer tries to nip or eat the newts they won’t fair too well. No, that won’t work at all. The newts require a lower temperature and a single-species setup. They will be nipped at. The newts may also eat the puffer…if they can inflate like other puffers the results could be lethal to both animals. I obviously can’t be 100% sure what you mean with the fin bending without seeing a video, but it’s definitely normal to some degree. You may want to look up a few videos to see if the behavior you see there is similar! For example, I see quite a lot of tail fin bending in the breeding video in this caresheet. Imported puffers do often have worms, though, so if you see other strange things such as the belly becoming flat again very quickly after eating/lumpy belly it may have something to do with that. As for breeding, I think it’s usually done in larger setups with a slightly larger number of puffers (at least 3). I think there may be some good info over at the puffer forum! I hope that helps a bit! Good luck with your new puffers. I want to have snail Tylomenia in the same tank as my Dwarf Puffers. When I had Black Helmet and Red Onion they were fine. But Tylomenia is more “out of the shell” and more vulnerable. I haven’t tried, sorry! Dwarf puffers are the least agressive puffer species, but to be honest I still wouldn’t try. Even dwarf puffers like to nibble on their tankmates from time to time and Tylomelania snails are not cheap as far as I know. Hi, I live in Edinburgh, I have five dwarf puffers in a heavily planted 45l tank, I first saw them when I paid a visit to Maidenhead Aquatics, I had gone to have a look for some shrimp to put into this tank after I had moved my neons and catfish to my 180l juwel, the minute I saw them, that was it, they where going to be mine, I dont know what it is about these wee fish, they look at you with their big eyes and its love at first sight. Now having rambled on about my puffers, and the main reason why I am contacting you is, where can I get snails for them, I asked pets at home, but theymkeep all the snails that arrive on plants for their Assasin snails, I have still to try Dobbies Garden Centre, but its probably the same story there, I am more than willing to pay for them I just need a few to start breeding them, if you or anyone who might read this knows or someone willing to sell me a few snails I would be more than grateful. Thanks for taking time to read this ramble. Hi! Glad to hear you’re enjoying keeping dwarf puffers, they are wonderful creatures 🙂 I would recommend upgrading them to at least a 100L soon, though, as they really need 20+L per fish. They can get a bit territorial and things may go wrong even if everything seems to go well right now. Their tank, something I do every three days, with both tanks. Once again thank you for your email. What you describe about the food sounds very familiar. Our puffer only really wants to eat blood worms and snails as well, so it’s definitely a good idea to keep a small snail population! I wouldn’t add another 4, that seems like a bit too many puffers for a 30 gal. 4 is actually the recommended number according to most sources; you may get away with a fifth puffer but any more of them may cause territorial issues. Either is fine as long as there are lots of plants, driftwood, hardscape etc.! Great to hear they’re doing well! Both the light and snail thing are not really a big issue, if it looks like they’re doing well I wouldn’t worry about it. They may be uninterested in the snail because they’re just lazy, there is no reason for them to hunt because they already receive enough food in the form of bloodworms. If you really want them to start hunting the snails you could try not feeding for a day or two, but it’s not really necessary. Good luck! Im not sure what type of snails you got for them to eat, but I would recommend to do some research on the perticular type of snail you have before you decide to let a large amount into the tank. Its very easy for a small population of snails to become out of control when they start breeding. If you do let them all into the tank, it will also give the puffers something to do. Mine spend the majority of their time slowly searching for tasty snail snacks. Hi, hope your puffers are doing well! As Kevin said, it depends a bit on the type of snail. Pond snails, etc. are great and you can add them whenever you like, the puffers will really appreciate them. I personally wouldn’t add them all at once, but you could! I’ve had bad experiences with Malaysian trumpet snails and dwarf puffers. The snails seem to somehow escape our puffer by only being active at night and the population has gotten slightly out of control. Good luck! I came upon this page while looking for information on breeding the little dwarf puffers (It appears a pair has formed since two of them are always swimming together). The snail population in the main tank has taken off recently and the little puffers are no longer able to keep the population down on their own. I was surprised to read here that you cannot or should not keep dwarf puffers with other fish, however, I have 4 dwarf puffers (2 male and 2 female) in a large planted community tank with 6 guppies, 5 molly , 2 swordtails, 5 platys, 3 dwarf gourami (one female), 2 honey gourami, 4 dojo loach, 1 hillstream loach, 4 different plecos, 7 red eye tetras, 2 German blue rams, 4 bettas (1 male 3 females) and something like 40-50 assorted fry. I have never seen any of the dwarf puffers attack or even show aggression towards any other species of fish (including small fry that may swim by). Every time I see them they seem rather committed to hunting and eating snails, and occasionally there will be a little fuss between two puffers, but never with another type of fish. Perhaps its the abundance of tiny snails that keeps them busy, but regardless, it is possible to successfully keep dwarf puffers in a community tank without incident. Interesting to hear you’re able to keep your puffers in a community with no nipping/aggressiveness. They are the most peaceful puffer species, but they’re still known for their tendency to harrass other fish. I see some other problems with your stock, though, like the bettas which should really not be kept in a community, especially not with fish like rams, puffers or platies. Just because it’s succesful now doesn’t mean it’s not very stressful for the fish nor that there won’t be any problems in the future. I also don’t know how big the tank is, obviously, but that is a VERY big stock. I’d really recommend you review it for a bit! I understand that this is probably not the reply you were looking for, but I do really want to mention it. Yes, I know its a rather large stock, but they all seem healthy, (nice fat bellies, good appetite, good color, no damaged fins). The tank is a well planted 90 Gal, with lots of little caves, tunnels, and other hiding places. Filtration is a fluval 404 canister, along with two powerheads/undergravel filters. I have read on other websites as well that the dwarf puffers can be aggressive to other fish, but I just have not seen it in my tank. They seem to go about their business hunting pest snails (there are hundreds in the tank), and pretty much ignore the other fish. Occasionally I will see one puffer chase another puffer for a moment, but they never hurt one another. As for the Bettas, they each have their favorite sleeping/hiding spots, and just like the puffers, they pretty much ignore all the other fish (including the fancy tail guppies) except for other Bettas and any fry that get to close. The male especially likes to chase the females around if they swim near him, but they are so much faster than he is that he never even comes close to catching one. The Bettas do like to eat fry though, which is probably a good thing since there is a new batch of livebearers every few weeks. I’ve had those four bettas in this community tank for about a year now. I believe the only reason I am able to make it work is because of the size of the tank, with lots of different live plants, caves/other hiding places, and I keep them all well fed. I feed a good variety of food twice a day so each type of fish has their preferred meals (micro cichlid pellets, flakes/crisps, freeze dried bloodworms, granuals, shrimp pellets, algae wafers and once a week or so I will toss in a cube of frozen brine shrimp or sometimes a blanched vegetable). I tend to slightly over-feed and I believe that is one of the major factors in being able to keep aggressions down. Since they all get a chance to eat their fill, there is no need to fight over food/territory. In fact, the only real aggression I see in my tank is not between Bettas or Dwarf Puffers but between the two male Platys, (they often fight over the big mamma Platy). Now Im not saying that Bettas or Dwarf Puffers, will always work out in a community tank, but with enough space, and food source, it is POSSIBLE to make it work for all the fish. Hi! 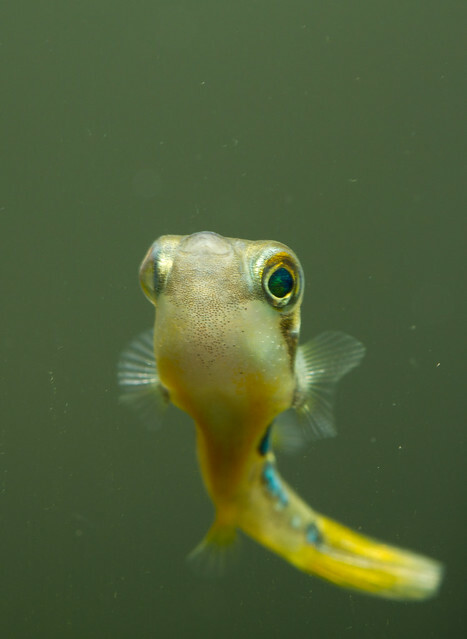 So great to hear my blog made you interested in keeping dwarf puffers. A 120L tank is a good place to start! Your water sounds fine, the plants should help take care with the nitrates. A nice hardscape or driftwood would help break sight lines to prevent boredom and make it easier for the puffers to divide their territories, so if you can fit it into your scape it might be a good idea! I think you can house 3-4 dwarf puffers in a 120L. Good luck! I’d love to hear how this turns out. Thank you for your fast reply yes I brought some nice redmoor wood today but going to have to hold it down. As it floats thanks again will keep you posted. good morning. im a very experienced fish owner. 13 tanks. from discus to planted community tanks, crystal red shrimp tank to seahorse. getting ready to set up a dwarf puffer tank. heavily planted isn’t a problem for me but I did read somewhere about a sand bed instead of gravel….? or even some kind of aragonite? is this true? never used sand in freshwater before. Great to hear you’re setting up a puffer tank! They’re fascinating little creatures and so much fun to keep. I’ve never heard of that! Fish like loaches, corydoras etc. obviously need a sand substrate because they are bottom feeders, but puffers are not. They may have been referring to sand being better for plants, because it definitely doesn’t have anything to do with the fish itself! That being said, sand is also definitely not a necessity for a planted tank, as you probably know. If you want to go for gravel that’s no problem for a puffer. I’m bringing home my first dwarf puffer sometime this week so I have been re-reading everything I have found on them so far, including this page. Had to comment when I saw you were also a Mari, not too many of us out there. Hi, sorry about my late response! I hope everything went succesfully with your puffer, they’re fantastic fish to keep! Im getting back into tanks after a LONG hiatus and me and my girl just picked up a 30 gallon at a petco sale. Im interested in a little puffer but keep reading how aggressive they are. I have always kept snails and shrimp as cleaners in my tanks and look to use them again. Im looking to REALLY aquascape this one with lots of low light, easy plants so I am sure it wont be board, but Im worried some of the other fish we choose might fall victim to nipping. Will these puffers pretty much attack anything or just what fits in its mouth like an oscar? we would both LOVE one of these guys. Are the females less aggressive by chance? Larger snails are definitely not an option, and I personally wouldn’t try crayfish. We do succesfully keep a colony of cherry shrimp with our own puffer, so that may be worth a try! I know other fishkeepers have also had success with kuhli loaches and otocinclus catfish, although I can’t tell you for sure. Hi I see this is an old post, but I have been thinking of starting up an aquarium again when I saw these adorable fish a couple of weeks ago! I have been doing a bit of reading up on them to make sure they fit into my lifestyle. 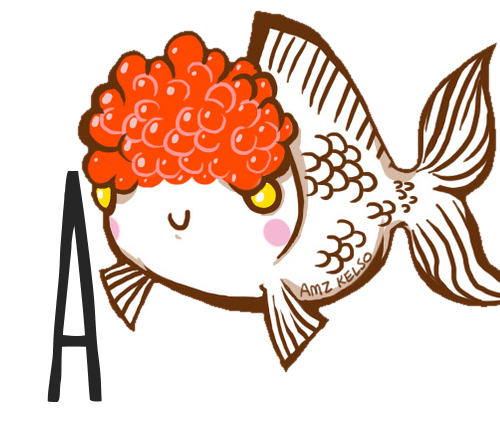 I have only owned goldfish (lionhead Orandas) as they are more like dogs to me than fish (: I get quite attached. I have owned tropical fish but prefer fish with personality. What I am worried about is I see they prefer a planted tank. I would love to own one but have been afraid of the difficulty of it. Am I correct that it would need special lights for the plants and that it would be difficult to keep up with water quality because of the plants? I love the way a planted tank looks!! Also I have read that the male Dwarf Puffer will have a dark stripe down his belly and dark behind the eyes. I see your Puffers in the video are male and female that are spawning! My Orandas spawned all of the time! It got really annoying as the male will follow the female around all of the time nudging her to release eggs. My tank was always needing cleaning! I tried to keep the water at a constant temp but I never could stop them.would be great if I breed them but I dont so I ended up giving the male to my daughter. So unless you want to breed I just wanted to add the info about how to tell males form female, that is if the website i got the info from is correct. But it appears to be so from you video. Also is it ok to feed them mainly the frozen thawed food? I also prefer fish with personality, so I know what you mean! Dwarf puffers are a great choice when it comes to this. Keeping puffers is very different from keeping goldfish obviously, but I’ve done both and I can’t pick a favorite! Dwarf puffers do need a planted tank because they get bored very quickly. A planted tank is not difficult at all with the right plants, so that’s probably not something to worry about! I personally am very lazy when it comes to my aquarium plants; I don’t use Co2, fertilizer or extra lighting, but with the right plants that’s really not a problem at all! Water quality is usually not a problem with plants as long as you remove dead leaves timely. Live plants actually absorb nitrates and help keep your tank stable, so I’d say it would actually be easier to keep up with water quality. There’s an article on Aquariadise on easy aquarium plants if you’re not sure which species would work. You can find it here! I can totally relate to your issues with your goldies spawning all the time. It gets very annoying! My goldies are male and they still chase each other to exhaustion. However, luckily there are usually no such issues with puffers! I’ve never heard anyone complaining about their puffers spawning all the time; the eggs are so small and few that they don’t foul the water. In fact, most people consider themselves lucky when their puffers spawn. I don’t think it’s necessary to try to get all males or all females, although you can indeed recognize the males from the dark stripe behind the eyes. You can also keep a puffer alone if you really want to prevent them spawning. Feeding your puffer mainly frozen foods is fine as long as you mix things up a bit. Try getting multiple types of frozen foods and also feeding snails and possibly other live foods if you can find them. I have 14 other tanks, mostly less than 25 gals, heavily planted, and tons of snails for them to gobble up every day. My grandkids can hold a snail just under the surface, and the puffers come right up and snag them! I do feed them bloodworms sometimes as well. As far as tankmates, i have a couple bristlenoses, a rather large algae eater, a couple corys, and 3 kuhli loaches, oh and a small bumblebee cat also. I am hoping they will spawn for me one day, although im afraid the roommates will eat their eggs…especially the catfish…anyway, just wanted to share. Thank you for sharing! Always great to hear about other people’s experiences with these amazing little puffers, especially from someone who keeps a bigger group in a bigger tank. They are definitely not brackish fish, although there are multiple brackish puffer species. Maybe you could show the manager at the pet store a caresheet or two? If you’re interested in breeding your puffers, which would be a great thing considering the fact that they are currently threatened in the wild, you could consider setting up a separate tank with about 3-4 of them. I’ve heard breeding them can be a bit of a challenge but I think it would definitely make a great project for a good cause! Good luck with your puffers in the future, although I don’t think you’ll need it – sounds like everything is going just fine! We have made an Indian stream biotope out of a rimless 6 gallon Fluval Edge, and decided to add a single female dwarf puffer to the family of 4 Hara Jerdonii. Never once have we had encounters of aggression with the little puffer. Hara and dwarf puffers also max out at about an inch and share very similar diets, water params, current flow and temp. So if you have a nano tank, are looking for a suitable tankmate for your dwarf puffer, and if you can find them in your LFS, I highly recommend a couple of Hara Jerdoni. Look em up! Wow, thanks for the tip! I can’t believe I don’t hear of Hara jerdoni more often, they seem like fantastic nano fish and a good combo with puffers habitat-wise. Literally don’t know anything else about them though! It’s a pity I’ve never seen them here because I’d love to keep them. Great to hear dwarf puffers are working for you, they’re amazing little fish. I was wondering whether you have any experience or info that concerns the aggression in females compared to males. I’ve read a lot of info from people stating that males are more aggressive due to territory and babysitting but nobody has said much about the females, so I wondered if a female dwarf would be a more suitable addition. There were a couple of posts on yahoo and other “ask & answer” sites but they’re not reliable. So glad you liked the caresheet! Although I have no specific experience with female puffers (no idea what gender ours is! ), I, too have read in multiple places that the females are less aggressive. You could check out The Puffer Forum and ask the people over there, they may have more experience with this because some members have kept both male and female dwarf puffers. That being said, it doesn’t matter whether the puffer is male or female if there’s vulnerable fish/fish with longer fins etc. involved. If that’s the case, then I would really not recommend going for it. In most cases it’s better to build the community around the puffer instead of the other way round, as they have such specific requirements. How will the puffers get along with rainbow fish? I am getting ready to set up my 56 gallon tank and really want to get a puffer but I would also like to get rainbow fish. I’m assuming that by rainbowfish you mean Melanotaenia boesemani (Boeseman’s rainbowfish), the most popular kind? I personally wouldn’t go for it as the rainbowfish like some open swimming space and their temperature requirements don’t really seem to match. They are also from vastly different natural habitats and I’m not sure a school of colorful, fast fish will be appreciated by the dwarf puffer. However, I can’t know for sure it will really stress them out, as I have no experience with Boeseman’s. If you didn’t specifically mean the Boeseman’s rainbowfish, I can’t really answer your question without knowing the species, as there are multiple rainbowfish species. For example, Iriatherina werneri (Werner’s rainbowfish) is also pretty popular, but I really wouldn’t recommend it due to the long fins. Thank you so much for your long comment, what a lovely story. So glad this caresheet was helpful to you! Good luck with your little puffer! Feel free to ask if you ever need any help. The site is not available for dwarf puffers? I do not have any but have lots of bad snails! I can not set up another tank but I love the sounds of them. Right now I am struggling to keep up with my 17 tanks. Oh dear, I had no idea Dwarfpuffers.com was not available any more, sorry! I’ll change the link. You could check out thepufferforum, although their forum is a general one, not dwarf puffer-specific. I wouldn’t recommend getting a dwarf puffer just to deal with a snail problem. Their tanks need to be adapted to their needs and unless your aquarium is already perfect for them you’ll be guaranteed to get problems. You could convert one of your existing setups to something dwarf puffer-proof if you’re really interested in keeping them though! They are wonderful little fish and definitely worth the work.